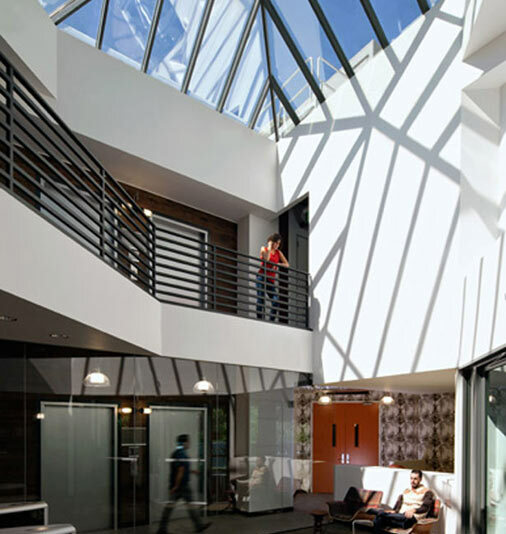 Earlier this year Microsoft completed renovations on its new “Garage,” a site in Redmond, Washington, that encourages innovation among small groups of employees. Throughout the building are “pods” like those shown here. In these temporary work spaces, teams of two to five employees can collaborate on projects for weeks at a time—something that can otherwise be tough in a company with almost 90,000 employees. Microsoft’s Garage has huge, open gathering spaces, such as the area shown here, and plenty of windows to let in daylight. Many companies and design firms are increasingly deëmphasizing closed private offices or cubicles in favor of common areas that allow opportunities for interaction among employees who can easily bring their work anywhere on mobile phones, tablets, and laptops. Companies whose employees telecommute can often consolidate office space, saving significant amounts of money. 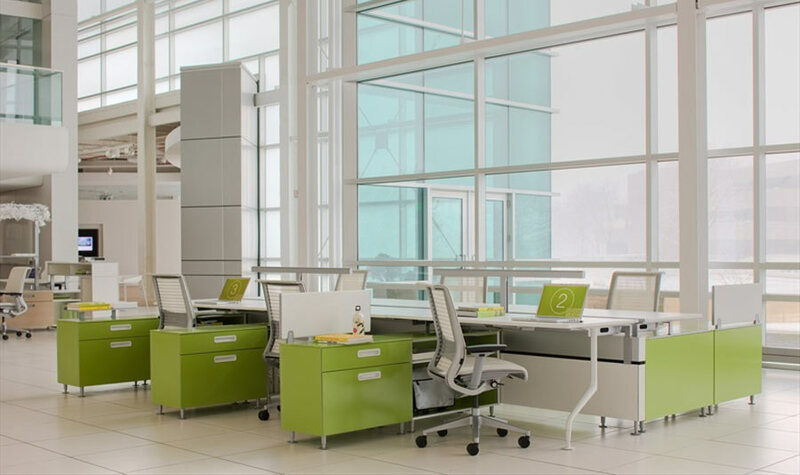 This workspace by Steelcase, an office design company based in Grand Rapids, Michigan, is designed to use minimal space but create an open feeling through strategic placement of drawers and privacy panels. The desks can function as communal property, with different employees using the same workspace as needed. This pod-like installation with adjustable privacy screens allows for semi-private meetings in communal areas. 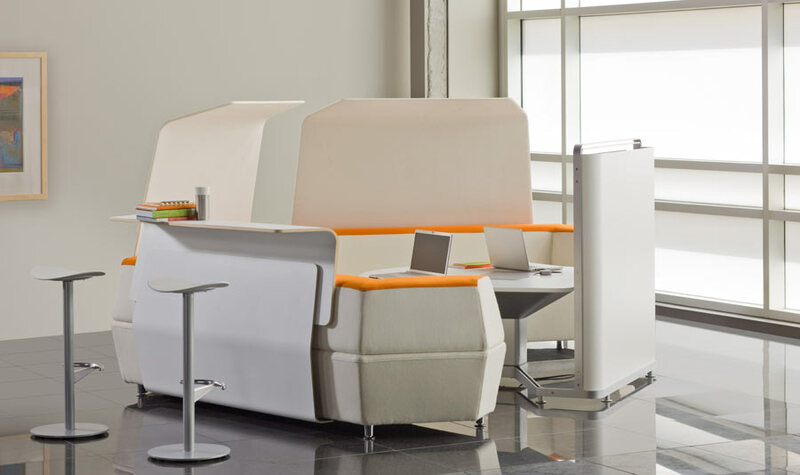 Other, larger versions incorporate adjustable video conference screens—replacing conventional conference rooms—and can be used for communal seating when not needed for meetings. Morgan Lovell, a U.K.-based design firm, is developing relaxed, informal interior spaces that invite employees to stop, talk, and collaborate. 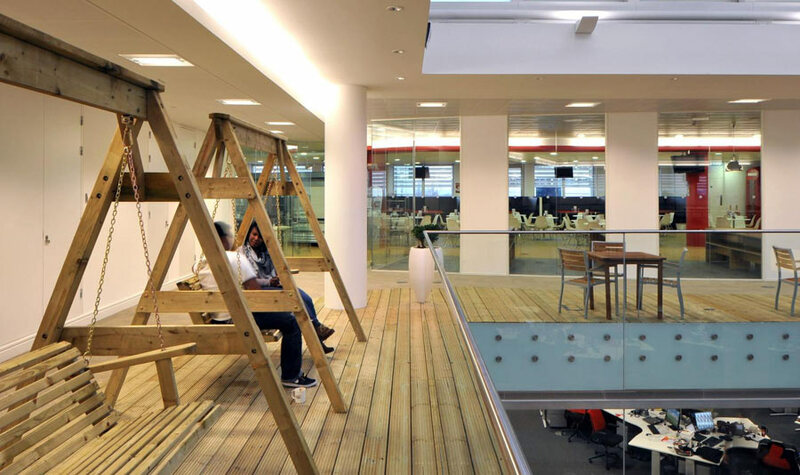 Shown here is the third floor of Rackspace, an IT hosting company. Morgan Lovell designed it to mimic a garden, complete with decking, swings, and fake grass.